This meme is hosted by Sam over at Taking on a World of Words. This is the first time I’m taking part (after seeing BookBoodle‘s post about it – thanks!). I’m only one chapter into this book, but so far, so good. The opening is an excellent short story in itself: a tale of a baby girl who gets struck by lightning but, unlike the rest of her companions, survives. I enjoyed Tracy Chevaliers’s five books which were published before this one, so I have high hopes for Remarkable Creatures. Remarkable Creatures is a stunning novel of how one woman’s gift transcends class and gender to lead to some of the most important discoveries of the nineteenth century. Above all, it is a revealing portrait of the intricate and resilient nature of female friendship. I know, I know… I’m well behind the rest of the world in reading this book. I haven’t seen the film, but unfortunately I had seen enough clips of it to already be in on a major spoiler before I started reading. However, lack of surprises aside, I enjoyed the book. Although there are few likeable characters, they are all drawn in depth and their voices are consistent and compelling. With the exception of a couple of scenes which dragged on, the book has excellent pace and achieves a balance between the more tense moments and revelations, and back story. I would recommend this book to anyone who enjoys psychological thrillers. Be warned: it’s not an uplifting read, although there are several moments of dark humour. While not the masterpiece some claim, it is a very well constructed book that shouldn’t disappoint readers. Who are you? What have we done to each other? These are the questions Nick Dunne finds himself asking on the morning of his fifth wedding anniversary, when his wife Amy suddenly disappears. The police suspect Nick. Amy’s friends reveal that she was afraid of him, that she kept secrets from him. He swears it isn’t true. A police examination of his computer shows strange searches. He says they weren’t made by him. And then there are the persistent calls on his mobile phone. So what really did happen to Nick’s beautiful wife? Now you’re probably thinking: “This woman reads a truly random mixture of stuff!” And that’s true. I’ve discovered contemporary rom-coms since becoming a mother and only having a few minutes to read a day. The stories are happy escapism, they zip along nicely and don’t require too much effort from my exhausted brain. I’ve previously read Operation Sunshine by the same author and, although it slipped into farce in places, it was a funny, warm, easy read. I’m hoping for the same from Amanda’s Wedding. A deliciously warm and hilarious romp of a novel set in twenty-something heartland. Thanks for the mention and welcome to the WWW club! I enjoy most of Chevalier’s books and haven’t heard of that one. I hope you enjoy it. 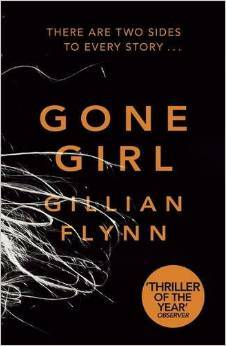 I only read Gone Girl once the movie came out so I was a bit behind the curve as well but avoided spoilers! Happy reading and thanks for participating in WWW Wednesday! Thanks! I’ll check out your post now! Tracy Chevalier writes some seriously good books. I haven’t read that one yet but I’m looking forward to it. Happy reading! Ha ha don’t worry you’re not the only one slow with Gone Girl; I didn’t read it at all yet! Looking forward to reading it though, and I’m glad to hear you enjoyed it. Remarkable Creatures seems interesting, gonna have to check it out. Happy reading! I’ve read Gone Girl a while ago… There is such a hype this novel that I ended up being disappointed by it. It’s not like I didn’t enjoy it at all, but the characters were a bit annoying and I guess I expected something better. I’m glad you enjoyed it better than I did though! Remarkable Creatures sounds like an interesting read; happy reading!